In the interest of keeping the homepage sidebar relatively organized and not a mile-long list of links that continue to grow, I've taken to organizing them here. I've also included a short description, since it's kind of nice to know where the heck you're going. So happy wandering, I hope you find something on the menu that you like! Seattle Post Intelligencer - The WP exists in a smaller, please-click-to-this-blog format on the PI. Jaunty Magpie - I also write a non-food, but pretty-looking art and style blog. FoodBuzz - Like an edible Facebook where I compulsively update my profile to retain the "98 buzz" status. Food Photo Blog - Food photos and recipes (I know, just like Tastespotting). Foodie View - Recipe, restaurant guide, food photo board, and general source for tasty things. 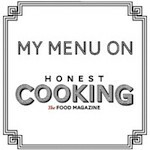 The Kitchn - See what's cookn in the Kitchn; great all-in-one source for quality food content. Tastespotting - When I'm lucky enough to get on here, I feel like a rockstar for the day. Cask Strength - Seattle bartender Andrew Bohrer waxes poetic on booze, history, and life behind the bar. G Girl, Eastside - Local gal who reviews happy hours and just shares funny things that make me laugh. Mark Sexauer's Cocktail Blog - Mixologist, locavore and enthusiast for making one drink one's greens. Washington Beer Blog - The who's-who of local Pac NW brews. Cheap Appetite - Foodventures on a budget, but never skimping on flavor or humor. The Eaten Path - Eating both on the go and abroad, written by several bloggers; great street food posts. Food Network Humor - You'll laugh so hard, milk will come out of your nose, without having to drink any milk. Picket Fence - Adventures in edible gardening in the Pacific Northwest. Sweet Paul - Food stylist and amazing at finding all things beautiful; Paul Lowe is my hero. Bellevue Local Table - Local guide to what's tasty on the Eastside. Burnt Lumpia - Don't know what lumpia is? You should. Delicious blog about Filipino food. Carol Egbert - Artist and foodie, Carol Egbert shares recipes and the good life that good food can bring. The Chickenless Kitchen - Beat the eggs. Whip the cream. Show no mercy - inspiring words to live by! Citron et Vanille - Silvia's blog is like a ray of delicious sunshine - beautiful photos, super-fresh ingredients. The Cookbook Chronicles - Lorna Yee leads an amazing foodie life in Seattle. Adopt me. Cookin' Canuck - Hearty, comforting meals that appeal to whatever you're craving. Debi Shawcross - Cookbook author and hostess with the mostess. Gourmet Fury - Feel the fire, heed the flame, feed the fury. With seconds, please. The Hungry Dog - One of Indy's favorites, as well as mine! A sweet blogger who cooks from the heart. Matt Bites - Beautiful food photography; Matt Armendariz is a multi-talented artist and devoted foodie. Omnomicon - Colorful photos and a delicious sense of humor provided by Miss Aleta. Orangette - Molly Wizenberg is the true Cinderella of how blogging and food can make a beautiful life. Papawow! - Entertaining food adventures and helpful tips -- a reminder of why food is joy. Peas Love Carrots - Funny, delightful, and a reminder why it's good to play with your food. Salty Seattle - She makes her own salt, cures her own bacon, and will absolutely inspire you. Seattle Food Geek - Techie by day, foodie by night -- no cape required. The Tasty Island - Hawaii food blogger preaching the delicious gospel of ono kine grindz. Tokyo Terrace - Yet another amazing life blessed with good food, exotic locales, and loved ones. Velveeta Ain't Food - Foodie fun with a blog that enjoys life with a heaping side of good humor. Cake Wrecks - Wanna have everyone stare at you at work, wondering why you're laughing out loud? Click here. Melanger - Beautiful cakes, cookies, and desserts of all kinds, from all around the world. Tartelette - Helen McSweeney reminds you of why dessert blogs and food photographers are a perfect mix.